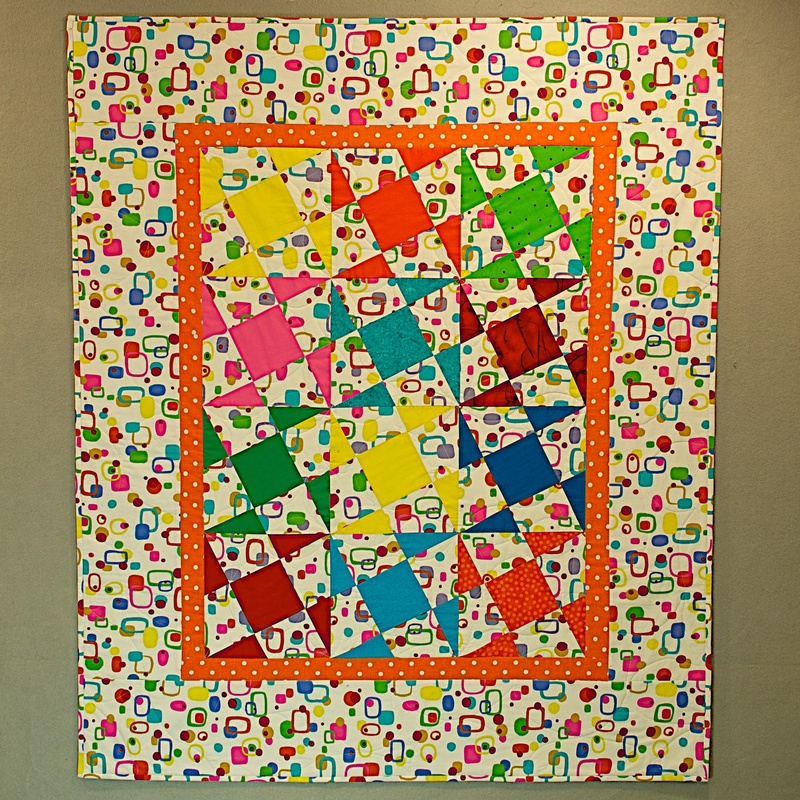 Now known as The Happy Quilt because it made me happy every time I worked on or looked at it, is finally quilted and photographed. This is the quilt I started while taking a class at ThimbleCreek Quilt Shop taught by the wonderful Freddy Moran last November, the quilt top being finished shortly after the class ended. What took the longest was the quilting. Since all three of the judges at International Quilt Festival Houston had commented that my Redwork Revisited quilt should (I would have said “could”) have had more quilting , I decided that I would spend extra time in the quilting phase of this project. It was a ton of extra work, and I think I like how it turned out. 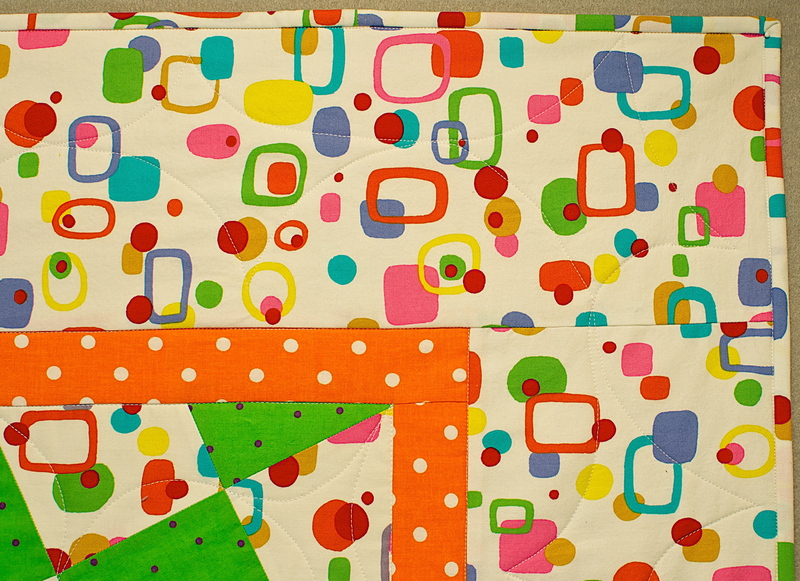 Here are a couple of details of the quilting motifs, lots of happy fun. Two new quilt projects using these clear bright colors along with the bold blacks and whites are in progress now, and I’m already finding that they are making me equally happy. Guess this is a new series. I’m always trying to decide between this wild wacky part of my brain and the other, perhaps older, part that still loves the vintage. Seems as though these two styles might have difficulty living in the same creative space, but it works for me. 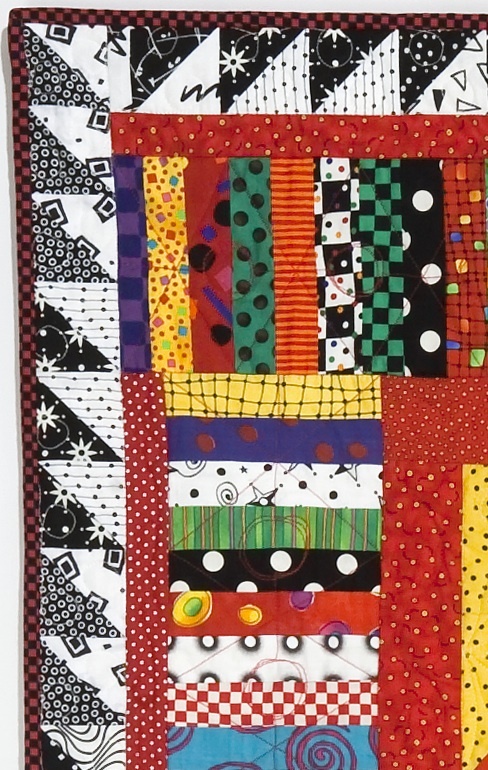 Here are a two more quilts in the “inspired by the fabric” family. I was fascinated with this wacky retro fabric because it reminded me of the Formica counter tops in our 50’s kitchen in Illinois, and only a very bold solid could stand out next to it. 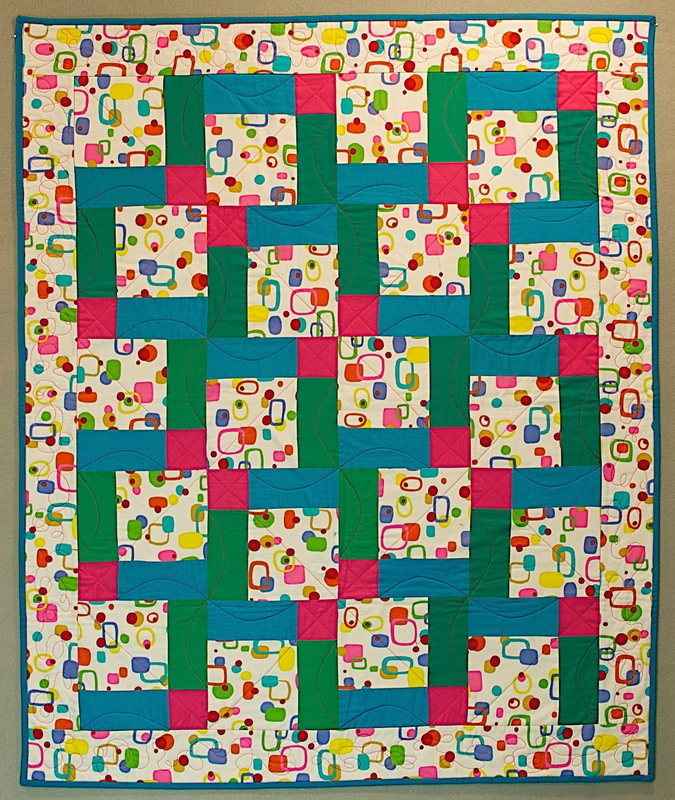 The challenge for this fabric was finding a quilting pattern that coordinated with the off-centered design of the block. I finally decided to make even more Formica designs in the border, which I tried to show in the detail. It was interesting for me just to start sewing, not planning ahead of time where the next line of stitching would go. After the Twirling Ninepatches was finished, I still had more of the border fabric leftover, so I decided to try the Disappearing Ninepatch quilt, a pattern that Deanna Davis had found online in a DIY tutorial. I think it is interesting to see how this very active fabric in the borders of both quilts looks slightly different with the turquoise binding, as opposed to the self-binding in the first quilt. 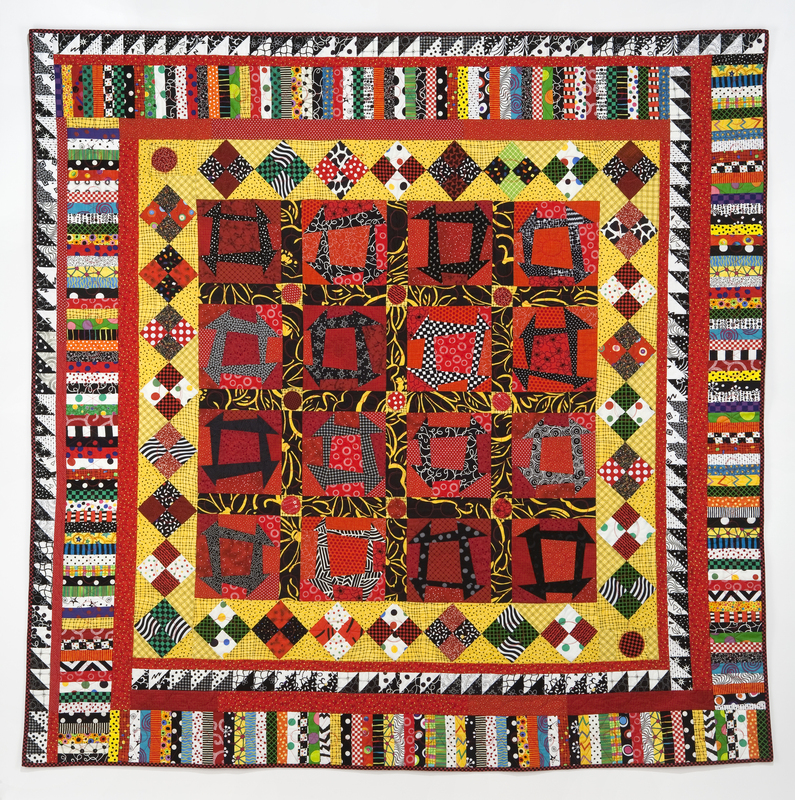 I made this small quilt in hopes of its inclusion in Mary Mashuta’s book Cotton Candy Quilts, her book of quilts with a depression-era focus, and I was very pleased when she selected it for the book. 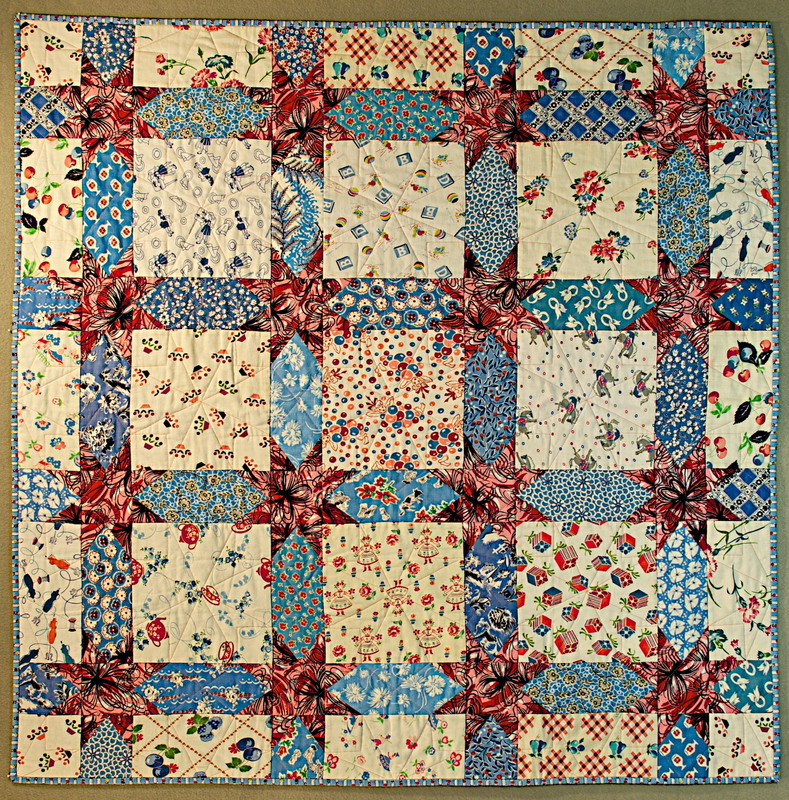 For this quilt I used the same feed sack for the large squares, and the same vintage fabrics for the burgundy red stars at the posts. 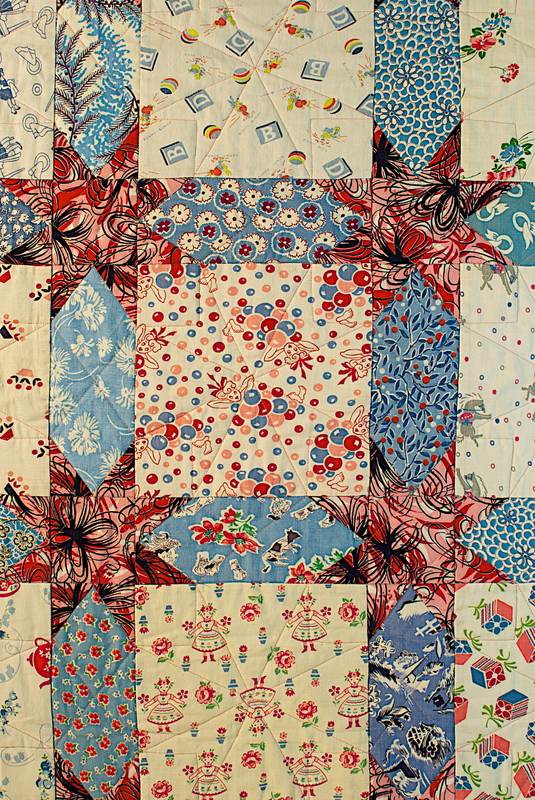 However, there is a lot of variety in the choices of the blues for the shapes in the sashing. 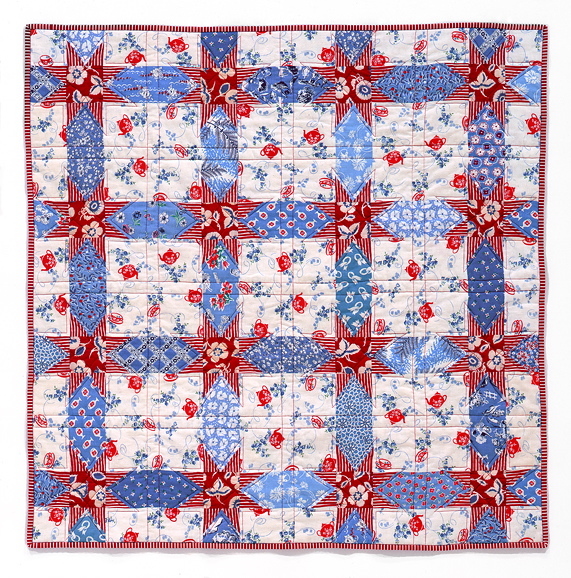 since I still had plenty of the blue patches left over from making the first quilt, I later made this next quilt, using for the large squares and rectangles all the wonderful feed sacks from my collection that had some blues and pinks on light backgrounds. The prints are really fascinating up close (see detail below). The burgundy stars here are all made from one feed sack. 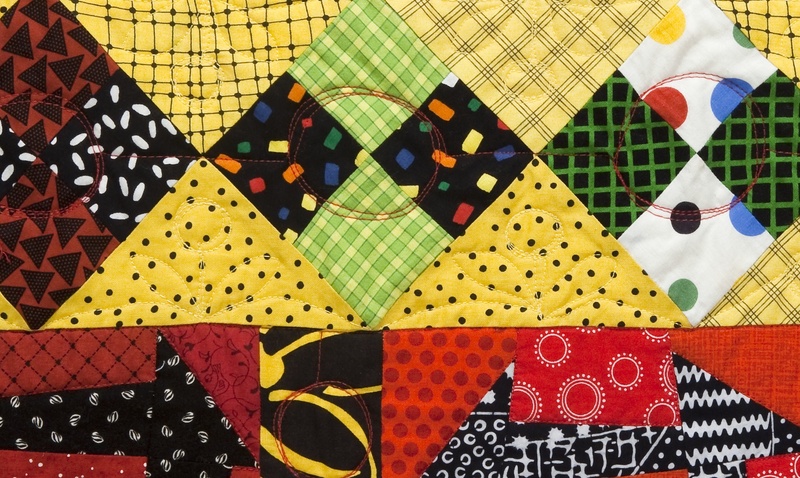 For this second quilt, I loved designing an interesting quilting pattern for the feed sack squares. I feel this added a little something extra to the piece. The Latest News: Just two days ago I got into Sibila’s studio for another photo shoot, so more, newer (and some much older) quilt stories will be coming soon.